I sent will an email and he told me definitly that intelligent life will ONLY exit outside of your solar system, so until you get the intersteller drive, you will not encounter any other intelligent life. I might send a reply asking if there will be ANY life within your solar system. I also asked him if "you be able to build vehicles that aren't for interacting with other cities", he said no. That means no civilian vehicles I'd say, no farming/fishing boats. All vehicles are for civ to civ interaction. I assume there are peaceful ones, but they are just for getting you to other places. So that is news to me, and I'm almost certain we haven't had a definite answer about either of those quesitons. So ponder and discuss the news. "So ponder and" what? So ponder and here's a million dollars? or so ponder and here's your own spaceship? I mean what the f- Oh no, I get it. THEY GOT HIM! Somebody shot him in the head! Oh Mason11987, I pine for you. Ok, but seriously, this all sounds rather fishy. I'm not calling you a liar, I just want some definite proof that you aren't yanking our chains, assuming you didn't get shot in the head. I could forward you the email if you want? Edit - O and I just ran through and updated SporeWiki to be up to date on the new news. Edit4 - And I suppose he is just answering questions that were details he COULD have stated earlier, but he doesn't want to give out brand new info. Extensive and fulfilling answers indeed! So life in your solar system is simply for colonizing lifeless planets to make money to expand right? Is there non-intelligent life in your solar system? Thanks for the incredibly quick reply, sorry for wanting to get whatever I can out of this. Spore has caused me to be the most excited about video games I've ever been in my life. In-credible. There is a probablity of it, yes. Wow. Will is efficiently precise. I guess he must be getting lots of mail these days. the possibility of life in the solar system in the game makes sense, considering there is the possibility of non-intelligent life forms in our own solar system in a couple places. I totally believe you Steve himself said if you e mailed him or the Dev teem they probably would answer. 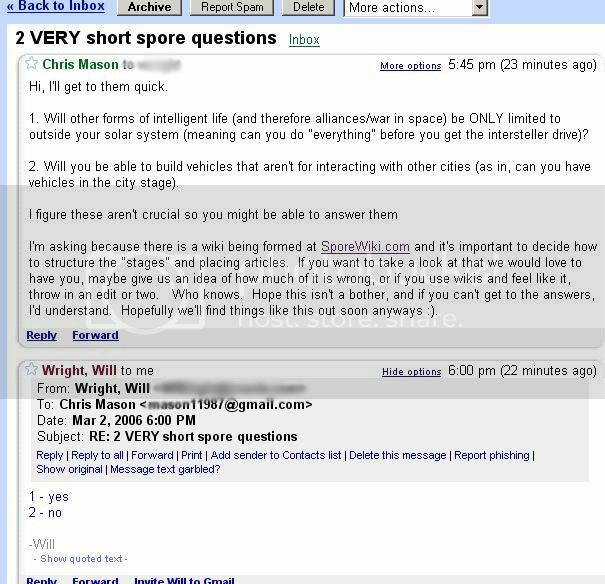 and its probably cool that you mentioned SporeWiki to hm because then he'll know that there is a good sized fan-based database. maybe we can find out from Steve how he tracked IPs to EA and then Zorlac can see if any of the IP hits on are from them. Thanks for the info. Makes me wonder if you can use the monolith on the creatures you find in your home solar system to make yourself some playmates. I wouldn't bug him all to much though. Place yourself in his position, he probably has a lot more things to do also. You just caught him at a good time I think. I said don't bother if you don't have the time. And if he is checking his public (enough) email, then he has time to spend on answering questions. My question isn't slowing down spore production, I can assure you. I think the monolith may only be available later on in the game, with planet busting, intersteller drive, and genesis device. Although I have no real basis for that. Yeah, I agree. The monolith is one of the metagames you get access to at the end. But at that point you should still be able to mess around with your home solar system, assuming it hasn't gone supernova or something.